Well, not really. I’m working on the next series of blog entries: evaluations of the different options for having film processed and scanned, now that the minilabs around the corner don’t “do” film anymore. I didn’t reach a definite conclusion yet, but I already know one thing for sure. It’s not going to be cheap. It will for sure change the way I use film. As long as processing and scanning were relatively inexpensive, I tended to take some risks – testing old cameras of unknown quality and bracketing a lot. Expensive lab services will bring me back to a more prudent approach – using better equipment, and paying more attention to my images while I’m shooting. 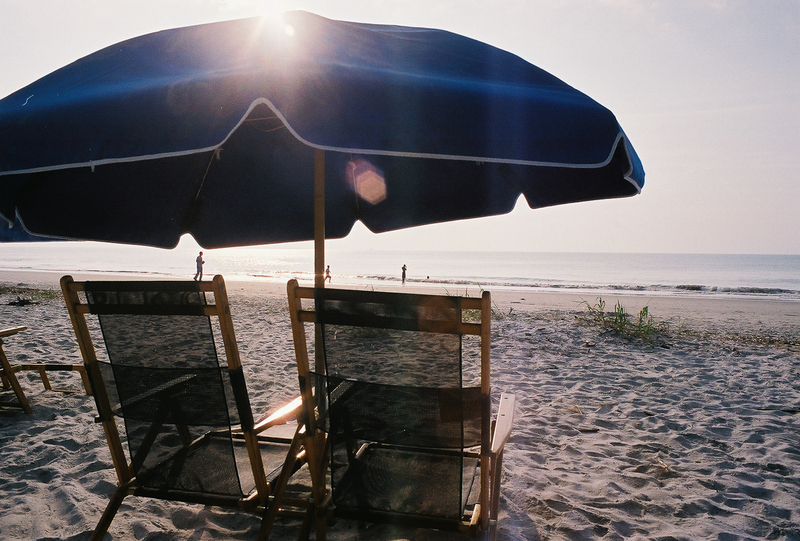 I started testing my latest acquisition, a very nice Olympus OM-2n, on a quick trip to Hilton-Head (South Carolina) a few weeks ago. But I have very few pictures to show at the moment, because of issues with the quality of pictures coming back from the labs I’m trying to evaluate. The Photokina is about to open in Cologne. The most interesting innovations are coming from Sony and Fujifilm. Sony’s SLT-A55 still looks like an SLR, it still uses the Sony-Minolta-Konica A-mount lenses, but its conventional reflex mirror has been replaced with a semi transparent film. Reflex cameras with a semi transparent mirror are no news: Nikon and Canon have used this type of design on multiple occasions, when they wanted to propose high speed cameras (up to 13 images per second for the Nikon F3 High Speed) while getting rid of the finder black-out during exposure. 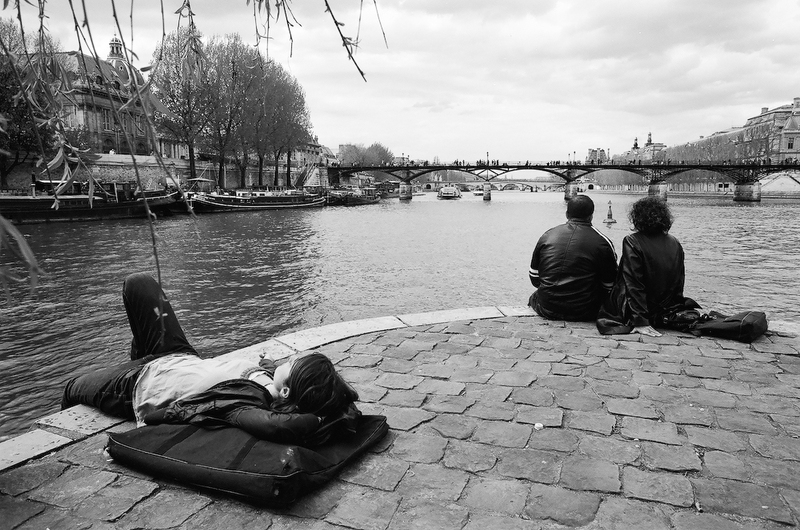 But the motives are different this time. It’s about adjusting the focus when shooting videos. There are currently two ways to control the focus on a digital autofocus camera. The simpler and cheaper way is to measure the contrast of the image directly on the sensor. The contrast of an image is supposed to be at its maximum when the image is in focus. So the camera moves the focusing elements of the lens forward and backwards until it finds the focusing distance which maximizes the contrast. This method is used primarily on Point and Shoot cameras, because the focusing process tends to be frustratingly slow and unacceptable for action photography. 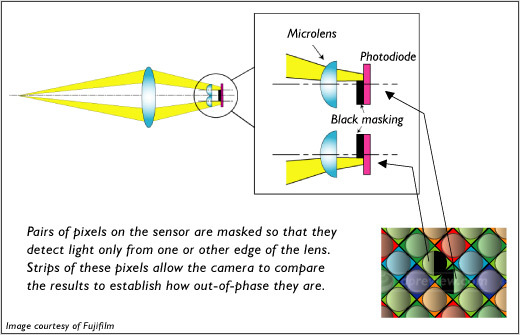 Autofocus SLRs have been using another method, named Phase Detection. Specialized components (semi transparent mirrors, micro-lenses and dedicated sensors positioned under the reflex mirror) calculate the optimal focusing distance and then “ask” the lens to position its focusing elements for that distance. Focusing is much faster and less prone to errors, but it requires more hardware and – in the conventional SLR design – it can only operate before the photographer presses the shutter release and the mirror has started moving out of the light path – which makes it unsuitable for video. Here comes Sony. 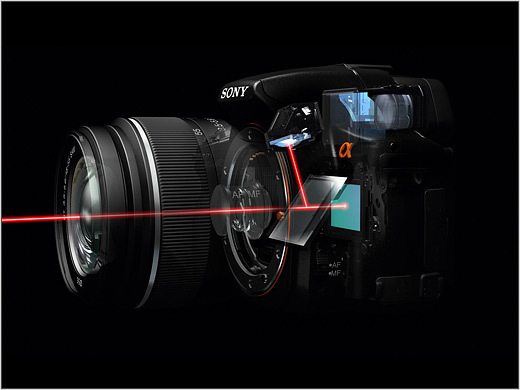 The semi transparent mirror of the SLT-A55 camera is only used to direct enough light to the Phase Detection autofocus system, because there is no conventional optical viewfinder anymore. It is replaced with a good (by current standards) electronic viewfinder, fed directly by the camera’s main image sensor. Of course, the semi transparent mirror is taking 33% of the light from the main imaging sensor, but it’s an acceptable drawback in the current state of technology. There is an even better way to solve the problem tough. A few weeks ago, Fuji presented a new point and shoot camera, the FinePix F300EXR, whose Hybrid Autofocus system operates most of the time in Phase Detection Mode, with the option to roll back to Contrast Detection in low light situations. dpreview wrote a very well documented subject about Fujifilm’s Hybrid AF. To make a long story short, some of the photodiodes of the FinePix’s imaging sensor serve double duty: they contribute to the production of the overall image, but they also feed a Phase Detection focus determination algorithm. It may still need some work (read this review from AKIHABARAnews), but on paper it’s a simple and elegant solution. Not surprisingly, Sony has a patent for an equivalent technology, and Panasonic is rumored to be working on another variant of the same idea. 10 years after the introduction of the first mass produced dSLRs by Canon and Nikon, digital photography has reached maturity. For the first ten years, manufacturers focused their attention on the sensors and on the processing algorithms, and retained the architecture of the AF SLRs from the mid eighties, which was itself derived from designs of the thirties. Now that the basic problems have been solved and that the consumers are happy with the equipment they own, manufacturers have to explore completely different routes if they want keep their production lines busy. Interesting times ahead.